South Beach Bingo is an online casino powered by Parlay, Betsoft, Rival and Octopus Gaming owned by Digital Entertainment Services. 70 results for South Beach Bingo. Up to $5000 on two coverall games per hour for the 1st 50 calls. Get $25 welcome bonus upon registration. Wagering requirements: 3X Wagering . 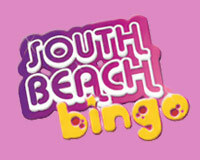 $25 No Deposit Bonus at South Beach Bingo. Wagering requirements: 75X Play through. $70 exclusive bonus thru IBS to try out the games, with a wagering requirement of 50x and max cashout of $100. $60 Free No Deposit Offer. 18+. New players only.Please Gamble Responsibly. See official website for details.